The image below depicts iliac crest tissue transfer. Iliac crest tissue transfer. Exposure of the external oblique fascia. Note the planned incision 2.5 cm medial to the iliac crest. The reconstruction of composite bone-containing defects of the head and neck has always posed a major challenge to head and neck surgeons. Free-tissue transfer has brought valuable additional tools to the armamentarium of the reconstructive surgeon. The mandible often is the focus of head and neck reconstruction because of its proximity to the most common locations for the development of intraoral carcinoma (ie, floor of mouth, tongue, retromolar trigone area). Advanced tumors of the oral cavity require adjuvant radiotherapy and complete surgical resection to achieve appropriate rates of disease control. From the viewpoints of cost and rehabilitation time, primary reconstruction has proven to be the most appropriate method of therapy. Mandibular reconstruction using free bone grafts has unacceptable rates of infection. Reconstruction using only a bone plate is associated with significant complication rates (eg, plate dehiscence, plate fracture) and fails to meet the requirements of rehabilitation. The surgeon performing mandibular reconstruction secondarily often has the added difficulty of working within an irradiated field. The free groin flap was one of the first revascularized free-tissue transfers described. Following its description, numerous attempts were made to include the ilium in the flap; however, these efforts proved to be unreliable. No doubt, interest in such a flap for mandibular reconstruction was based on Manchester's description of the anatomic and structural similarities between the anterior ilium and the mandible. The indications, utility, advantages, and disadvantages of the DCIA flap in oromandibular reconstruction were nicely outlined in a couple of articles. [7, 8] One specific indication reported for this flap (as well as a major advantage) is for reconstruction of through-and-through defects of the oral cavity, mandible, and skin. At the same time, one of the most significant problems is the thickness of the soft tissue component and the relative immobility of the skin element in relationship to the bone. Where possible, the internal oblique muscle is used for intraoral lining to circumvent this problem. The deep circumflex iliac artery (DCIA) flap may be used for mandibular reconstruction, especially in patients with full dentition. Publications describing the use of the iliac crest are limited in number, compared with other options. These other options include the osteocutaneous radial forearm free flap (for small lateral defects) and the fibula and scapular free flaps (larger, through-and-through defects). The DCIA originates on the lateral aspect of the external iliac artery. The diameter of the DCIA at its branching from the iliac artery is 2-3 mm. The DCIA gives off an ascending branch that supplies the internal oblique muscle. This branch typically arises at or about the anterior superior iliac spine (ASIS). The artery provides blood supply to the ilium through periosteal and endosteal branches. Musculocutaneous perforators provide arterial blood supply to the skin overlying the iliac crest. Rarely, the ascending branch and the DCIA have separate origins from the iliac vessel. The DCIV follows a similar course to the artery. It is slightly longer because the iliac vein is more medial. A small branch always joins the vein just before its origin from the iliac vein. The vein diameter is 3-5 mm. The vascular pedicle is found in a prominent groove medial to the iliac crest. It is encased within the fascia of the iliacus and transversalis muscles. The vascular pedicle is not seen directly, and a full-thickness muscle cuff must be harvested (approximately 2.5 cm) on the medial aspect of the iliac crest to avoid injury to the pedicle. The vessel size and length is substantially shorter compared with other microvascular flaps (osteocutaneous radial forearm, fibula, scapula) available for reconstruction to the maxilla and mandible. The lateral femoral cutaneous nerve has a variable relationship to the vascular pedicle; alternately, it can lie deep or superficial to the vascular pedicle, or it can lie between the vascular pedicles. Besides prior surgery with injury to the vascular pedicle, chronic cough and steroid use are considered the only contraindications to using the DCIA flap. These situations increase the risk of hernia formation to an unacceptable degree. In patients who have preexisting impaired mobility due to lower extremity problems, harvesting the flap from the most functional extremity should be discouraged because the recovery process can be protracted. 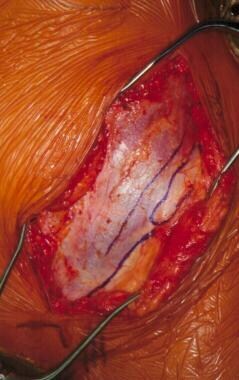 Medalie DA, Llull R, Heckler F. The iliacus muscle flap: an anatomical and clinical evaluation. Plast Reconstr Surg. 2011 Apr. 127(4):1553-60. [Medline]. Pohlenz P, Klatt J, Schön G, Blessmann M, Li L, Schmelzle R. Microvascular free flaps in head and neck surgery: complications and outcome of 1000 flaps. Int J Oral Maxillofac Surg. 2012 Jun. 41(6):739-43. [Medline]. Jung HD, Nam W, Cha IH, Kim HJ. Reconstruction of combined oral mucosa-mandibular defects using the vascularized myoosseous iliac crest free flap. Asian Pac J Cancer Prev. 2012. 13(8):4137-40. [Medline]. Taylor GI, Townsend P, Corlett R. Superiority of the deep circumflex iliac vessels as the supply for free groin flaps. Plast Reconstr Surg. 1979 Nov. 64(5):595-604. [Medline]. Taylor GI, Townsend P, Corlett R. Superiority of the deep circumflex iliac vessels as the supply for free groin flaps. Clinical work. Plast Reconstr Surg. 1979 Dec. 64(6):745-59. [Medline]. Ramasastry SS, Granick MS, Futrell JW. Clinical anatomy of the internal oblique muscle. J Reconstr Microsurg. 1986 Jan. 2(2):117-22. [Medline]. Urken ML, Vickery C, Weinberg H, et al. The internal oblique-iliac crest osseomyocutaneous microvascular free flap in head and neck reconstruction. J Reconstr Microsurg. 1989 Jul. 5(3):203-14; discussion 215-6. [Medline]. Urken ML, Weinberg H, Vickery C, et al. The internal oblique-iliac crest free flap in composite defects of the oral cavity involving bone, skin, and mucosa. Laryngoscope. 1991 Mar. 101(3):257-70. [Medline]. Brown JS. Deep circumflex iliac artery free flap with internal oblique muscle as a new method of immediate reconstruction of maxillectomy defect. Head Neck. 1996 Sep-Oct. 18(5):412-21. [Medline]. Sönmez E, Tözüm TF, Tulunoglu I, Sönmez NS, Safak T. Iliac crest flap for mandibular reconstruction after advanced stage mandibular ameloblastoma resection. Ann Plast Surg. 2012 Nov. 69(5):529-34. [Medline]. Brown, JS, Magennis, P, Rogers, SN. Trends in head and neck microvascular reconstructive surgery in Liverpool (1992-2001). Br J Oral Maxillofac Surg. 2005. 44(5):364-70. Chen J, Jiang C, Min A, Ren H, Gao Z, Ian X. [Chimeric deep circumflex iliac artery perforator flap for the simultaneous reconstruction of the composite oromandibular defect]. Hua Xi Kou Qiang Yi Xue Za Zhi. 2015 Jun. 33 (3):276-80. [Medline]. Pierini M1, Di Bella C, Dozza B, Frisoni T, Martella E, Bellotti C, et al. The posterior iliac crest outperforms the anterior iliac crest when obtaining mesenchymal stem cells from bone marrow. J Bone Joint Surg Am. 2013 Jun 19. 95(12):1101-7. [Medline]. Iliac crest tissue transfer. Incision of the external oblique allows exposure of the internal oblique. The dissection is in an avascular plane and extends to the costal margin superiorly and the linea semilunaris medially. Iliac crest tissue transfer. The vascular pedicle is shown with the lateral femoral cutaneous nerve lying just beneath it. Iliac crest tissue transfer. The donor site is managed by direct approximation of the iliacus and transversalis muscles. The closure is completed by securing a mesh to the residual ilium and the external oblique fascia. Iliac crest tissue transfer. The harvested flap before contouring. Iliac crest tissue transfer. Flap inset to the mandibular defect. Note opening osteotomies are filled with cancellous bone particles. The muscle is then wrapped around the bone to provide a soft-tissue coverage and a seal of the oral cavity. Iliac crest tissue transfer. An early postoperative film demonstrates that the bone harvest can equal the dimensions of the resection site.